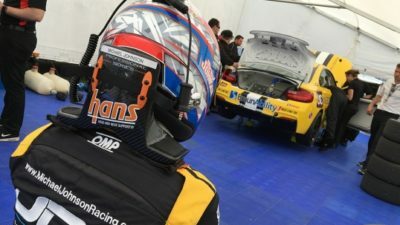 Watkins Glen, New York (June 27, 2016) – American paralyzed BMW driver Michael Johnson is geared up for his second race of the 2016 IMSA Continental Tire SportsCar Challenge season, with the Continental Tire 150, in rural New York at the legendary Watkins Glen International. Johnson’s first race of the 2016 season was on April 28, at Laguna Seca, in Calif.
Johnson didn’t race in the first two competitions of the season, due to his modified car not being completed in time. His race car is specially equipped with hand controls, provided by GuidoSimplex. Johnson’s car features a complicated brake, gearshift and throttle system, with which Johnson uses his hands to control systems other drivers manipulate with their feet. The weekend’s race at The Glen will challenge the drivers on the 3.4-mile course during a race that will last two hours and 30 minutes before the checkered flag will fly. Johnson is of course paired with teammate Stephen Simpson, from Cape Town, South Africa, in the Street Tuner (ST) class. Practice for Johnson and Simpson begins on Thurs., June 30 at 3:00 p.m. Qualifications will be on Fri., July 1 at 1:25 p.m. with the race to be held on Sat., July 2 at 12:25 p.m. All times Eastern. The race will be televised on a tape-delayed basis by FOX Sports, and but will be streamed, live, on IMSA.com. In addition to primary backing from Universal Coating, Johnson’s racing efforts are also supported by: Arai Helmets, OMP, and BraunAbility® Wheelchair Vehicles & Wheelchair Lifts. For more information, please visit: www.MichaelJohnsonRacing.com or follow Johnson on https://twitter.com/MikeJRacing and https://www.facebook.com/michaeljohnsonracing. For all media, partnerships, or business inquiries, please contact Josh Reasoner marketing@mikejracing.com.